The Gray Copper trail is located in the Ironton Park area of the Uncompahgre National Forest, along the Million Dollar Highway, near Ouray, Colorado. The trail begins off of County Road 20 where it follows Gray Copper Gulch between Brown Mountain and Red Mountain Number 1. After climbing for a couple of miles the trail passes by the scenic Gray Copper Falls. Hikers can turn around at that point or continue climbing along Gray Copper Creek to where the trail ends at a junction with the Vernon Mine Road. To get to the trailhead drive south out of Ouray, measuring from the Hot Springs or Visitor Center, on US Highway 550, a.k.a 'The Million Dollar Highway', for 8 miles. Turn left just past the Ironton Park Ski area sign onto County Road 20. 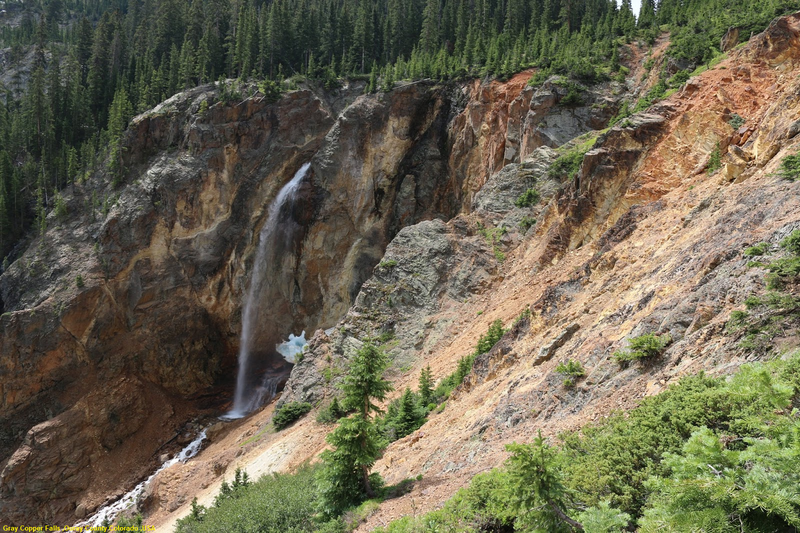 Drive past the tailings pile and take the left fork following the sign for Brown Mountain. After taking the left fork there is another intersection where you continue straight ahead on the middle fork. If you don't have a high clearance vehicle then park at this intersection and begin hiking from there. It will only add about a tenth of a mile to the hike.